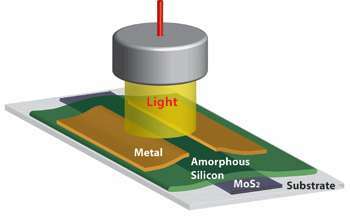 Shown is an experimental photodetector made out of amorphous silicon and molybdenum disulfide (MoS2). "Our discovery could bring transformational changes in applications from biomedical imaging to solar cells to energy-efficient transistors," said Salahuddin. The researchers published their findings today (Aug. 2) in the open-access journal Scientific Reports.